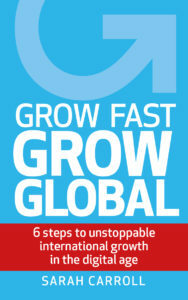 British digital growth expert, Sarah Carroll, finalist in book awards with GROW FAST, GROW GLOBAL to help businesses achieve international growth in the digital age. The Business Book Awards 2019 is celebrating the best in business books and the work of authors who have shared their industry or market knowledge, experience and expertise as a published book. 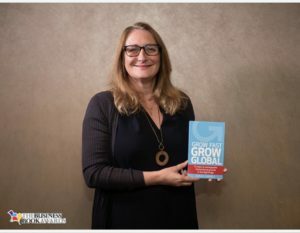 At a shortlist reveal party in London on 16 January 2019, Sarah Carroll was over the moon to find out that her new book ‘Grow Fast, Grow Global: 6 steps to unstoppable growth in the digital age’ was a finalist in the Sales and Marketing category. Sarah’s book specifically focuses on how to drive online sales around the globe. She is keen to teach companies of all sizes, and at all stages, how they can embrace digital opportunities with her tried and tested 6-step method, as well as help them avoid costly mistakes when venturing into new markets. “One of the reasons I’m so passionate about growing globally is the transformative effect I’ve seen it have on businesses: failing businesses have suddenly become incredibly profitable, businesses that were just about surviving have enjoyed their best year ever and ambitious companies have achieved fast growth and increased their revenue tenfold! My approach to global growth really does work. Global growth is not as complicated or overwhelming as a lot of people think, providing you use digital tools to do it.” – Sarah Carroll. SARAH CARROLL, founder of Grow Global, is a world-leading expert on how to grow a business globally using digital strategies. Over the last 10 years, she’s propelled over 5,000 companies on their international digital journey and helped them to achieve up to 10x growth by translating her depth of knowledge of digital trade into simple, clear actions to follow. She has distilled this into a failsafe 6-step method, which she shares in her book, GROW FAST, GROW GLOBAL, and can be used by a variety of businesses regardless of size or what they sell or to whom… or where! She also runs digital accelerator training programs for companies of all sizes and will be launching online courses later this year. Digital and paperback copies available for review. Sarah Carroll is based in Brighton, UK and available for interview and editorial commission. Filed Under: GROW FAST, NEWS, WHAT'S NEW?